In this post, we’ll run through a hot-add of a DS4243 shelf. 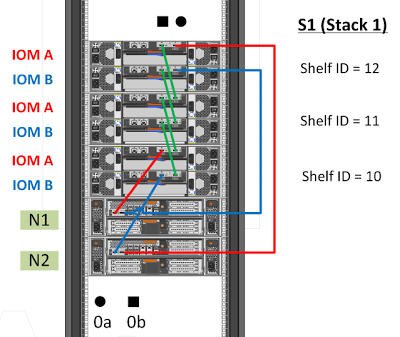 To illustrate this, below are two visio diagrams of a pair of FAS3270 heads (with IOXMs) - one cabled from top to bottom, and the other cabled bottom to top - with an existing stack of 3 shelves. 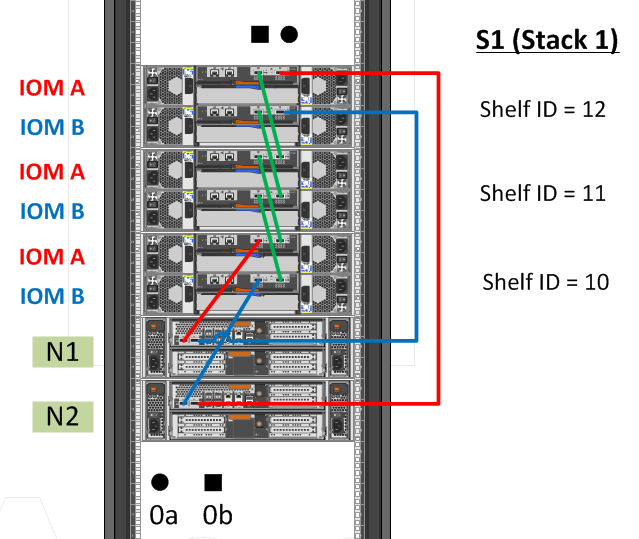 Whether you’re hot-adding a new shelf to the bottom of a stack or the top (most likely) the procedure is the same. The commands used in this post are mainly for Data ONTAP 7-Mode. Note: The SAS cables will be black and the use of colour here is to hopefully make things clear. - can be used to verify IDs already in use. - should show the A path having gone down on CTRB, the B path should still be up. - should show the B path having gone down on CTRA, the A path should still be up. 11. 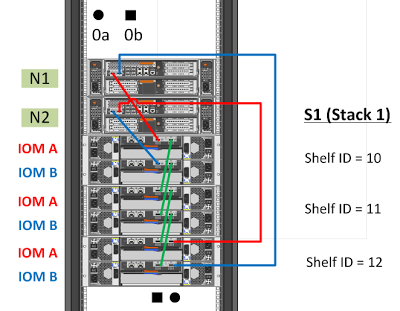 The ACP cabling is pretty straight forward - just move the two ACP cables from circle ports on the original last shelf in the stack, into the ACP circle ports on the new shelf, and daisy chain from circle to square the remaining ACP ports. 12. Assign disks and enable options disk.auto_assign on as required. Note: “Data ONTAP does not always automatically update the disk drive, disk shelf, and ACP firmware on hot-added SAS disk shelves” - please read the “Installation and Service Guide” for more information.